Holding a pastel stick on my palette. When beginning each painting I start from a place of color. Here you'll notice the bright range of these colors as well as the makeup of the dry pigment. The hand rolled pastels I use have the least amount of binder and have an almost buttery feeling as if touching the wing of a butterfly. Technically, pastel is powdered pigment rolled into round and held together with a small amount of non-greasy binder. When protected by glass, pastel is the most permanent of all media because it never cracks, darkens, or yellows as do oils paintings. Because each layer consists of microscope bits of pigment, light bounces through and around these and creates a beautiful luminosity unattainable by acrylics. I create my pastels paintings with a technique not normally seen in soft pastels. 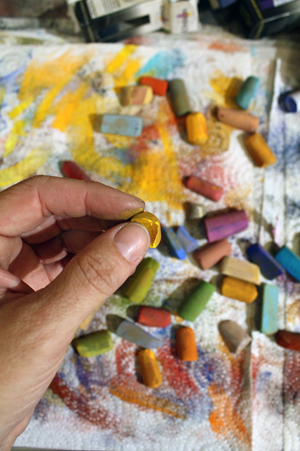 I carefully apply and blend the dry pigment with the tip of my finger. No other brush or tool is used. The smooth, rolling clouds are inspired by the nearly visible brush work of the old masters' technique of creating luminous skin on their subjects. I use a specially prepared pastel paper that has a rough but nearly imperceptible "tooth" that grabs on to the pigment allowing me to work with countless layers yet still maintain the vivid, clear colors. My paintings take many hours of adjusting tones and color balance, constantly adding more pigment to achieve a near 3D effect to the skies set upon and balanced with the textures strokes of the foreground. For more information about framing, purchasing, commissions, shipping and more, click on FAQS.